In 2006, there was a forum I frequented where we would often share funny things from around the web, such as the old "Chuck Norris Facts" meme (I even Made Chuck Norris the first Superstar of the Year). This included videos from Google Videos and Metacafe, and I noticed there were a lot of videos from this new site called "YouTube". I remember thinking that this was a dumb name. There were a few videos, in particular, which I enjoyed the most. One of them came from a guy called "The WineKone". There was a sketch from a duo called "Barats and Bereta". And there were a few videos from these young guys who called themselves "Smosh". I decided to check out more videos from these people. The first time I clicked on a channel link, I thought I had mistakenly gone to MySpace, as the classic channel design looked like a MySpace page. After browsing around a bit, I realized I was on something called a "YouTube Channel". Upon my arrival to The WineKone's channel, I found a video featured on his page called "Internet Creepo" which involved several other people who made videos for YouTube, including Smosh. I thought it was so cool seeing Smosh appear in a WineKone video. I had never seen an internet video which addressed other people who make internet videos. I checked out the other people who were featured in that video, and found that they also would address other people who make YouTube videos, or "YouTubers". There was a whole network of people who referred to themselves as the "YouTube Community". I decided I wanted J-Dubb's Theatre to be a part of it. I received a digital camera for Christmas that year. 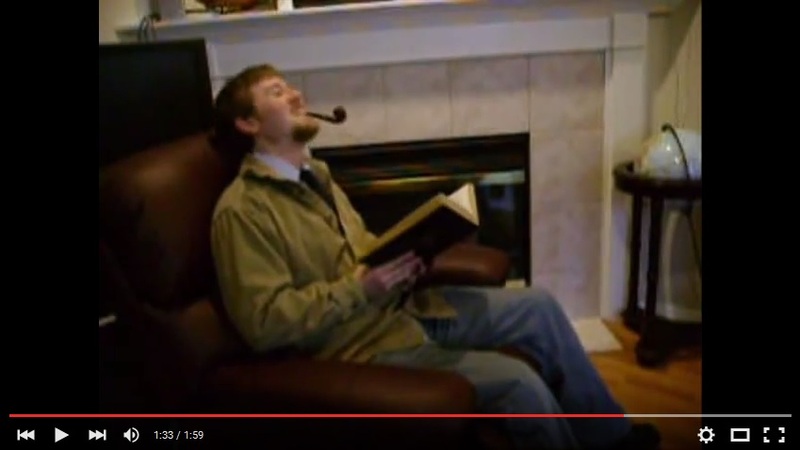 In February of 2007, I uploaded a welcome video to my new, J-Dubb's Theatre YouTube channel, where I recreated the scene in the banner of my blog, with the pipe and the book. I proceeded to upload a new video once a week, most of which were video responses to other YouTubers. Only, instead of just talking in front of a webcam, I made my responses "J-Dubb's Theatre style" which would involve a sketch comedy act. At this point, J-Dubb's Theatre was all about blogging and videos. In the Summer, I started a series called, "The Network". This began with a fan fiction video. There was a series on Youtube called "Lonelygirl15", about a vlogger and her friends as they tried to evade a secret society called "The Order". The series was filmed as if these were real vloggers, telling the stories from their webcams. Fans of the series often made fan fiction videos. So I decided to do my own, where I get abducted by The Order. After this, I uploaded posts to my blog from the point of view of a member of the resistance, who was searching for me. After that, however, I decided to expand outside of the LG15 series, into a "bigger picture", where a secret society which runs the television networks is taking over YouTube through some sort of supernatural means, with the help of an ethereal network executive. I ended the series by posting the videos which detail my escape, and defeat of The Executive. This was also the first video to include the J-Dubb's Theatre theme tune. In 2008, I went through some changes. I decided it was time to start thinking of myself in terms of a successful professional, rather than a young collegian type. I changed my hair and began dressing differently. I would still tune in to KUFO, on occasion, and listen to the Marconi Show. But during this time, I decided that I had outgrown a 40-something shock-jock who acts like a frat-boy. I decided to unlink from the KUFO website. After another year's worth of videos, at the end of the Summer, I decided to continue The Network, in a series of more cinematic videos than my usual content of the time. In this series, The Executive from the previous series, named Belphegor, had taken on my form and taken over my life, and was recruiting for a new Network. This was supposed to be an interactive series to promote my channel, where Belphegor would post video responses and attempt to recruit other Youtubers. Due to high demands with school and an internship, however, it didn't pan out this way, and just became a series of videos.